Living without dairy is something I vowed I would never, ever, ever do. I know some of you reading this right now feel the same way. We've talked about it. I sense your apprehension. But if you need to bid adieu because your nose is too stuffed up, your skin is too itchy, your head aches too often, or your phlegm is simply too much for your lover to handle any longer, you may at some point have considered giving up dairy. I'll be honest with you—there is no true replacement for aged cheese, Greek yogurt, a tall glass of cold milk, or a pint of Ben & Jerry's Phish Food. But that doesn't mean I can't try. I've found plenty of alternatives which add creamy richness to my meals that don't result in any of the nasty symptoms described above. One of the gold medal winners in this family is my Coleslaw Topper. It is so quick and easy to prepare. Ten minutes or less to a ten times more enjoyable meal. I use it to top-off my Crock-Pot BBQ Chicken Perfection, Five Fold Burrito, and Grilled Fish Tacos. Try it alone or as a topper to your favorite taco or burrito style meal and welcome back the creaminess you crave. You might even find yourself early one morning serving up a dish with cold rice for breakfast. At least that's what I do. Is that weird? In a large bowl, combine the mayonnaise, rice vinegar, celery seed, salt and sugar. Shred the cabbage into short and thin pieces. 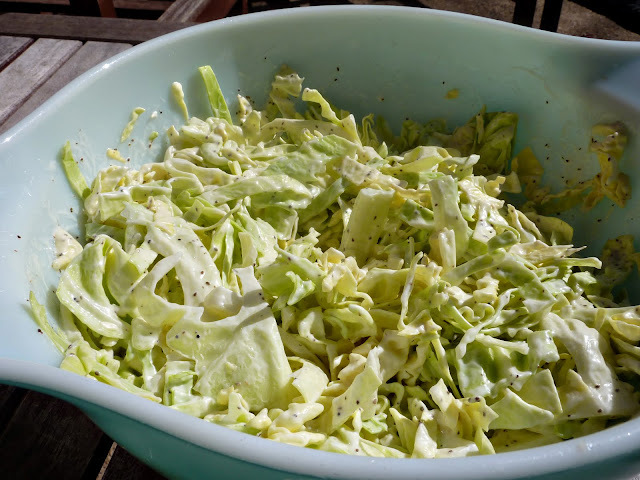 Dump cabbage into mayo concoction. Stir it around to coat the cabbage well. Refrigerate. Use within 24 hours. I've had John Mellencamp in my head lately. I like him. I've always liked him. Is that weird?